It’s so cliché, but everything is better with bacon, especially sweets. I love the combination of smokey, salty bacon with baked goods. 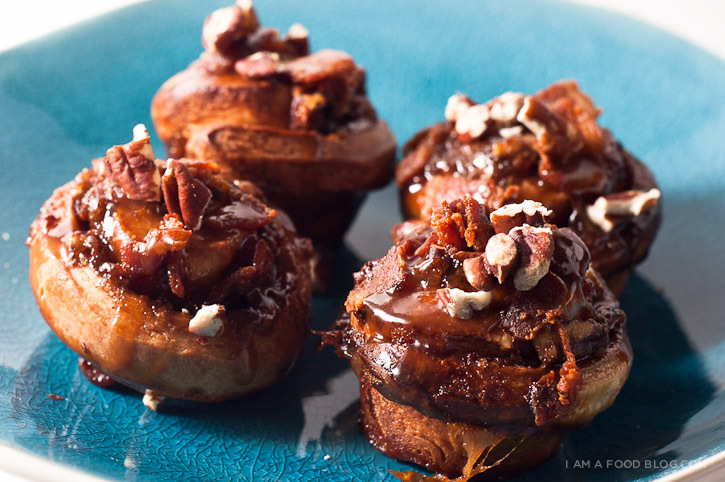 When I saw the sticky buns on the cover of the April Bon Appétit, I knew I had to make them — with bacon. I decided to quarter the recipe and make mini buns, just because having 9 full sized sticky buns would have been too over the top, even for me. I love that baking is a science — scaling recipes means that they’ll turn out every time, as long as the ratios are correct. These buns were a little finicky, with two rises and a refrigeration period, but they were well worth it. The buns were soft, fluffy and studded with toasted pecans and crispy bacon. It was too bad that I decided to make mini buns because the soft insides were the best part. If I made these again, I’d definitely make full sized buns. We all agreed that we wanted more insides. That being said, these were a hit, especially considering that our friend Bruce (who doesn’t like sweets or bacon) gave them a thumbs up. 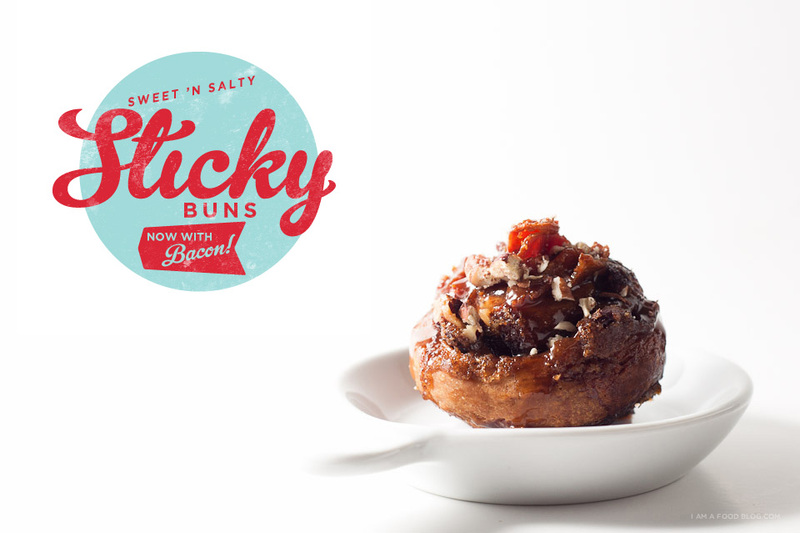 i am cinnamon-y, i am bacon-filled: i am bacon sticky bun! Make the dough: Heat milk in a small saucepan over medium heat until an instant-read thermometer registers 110°–115°. Transfer milk to a bowl; stir in 1/4 teaspoon sugar. Sprinkle yeast over milk and whisk to blend. Let sit until yeast is foamy, about 5 minutes. Add 1/2 egg; whisk until smooth. Combine remaining sugar, flour, and salt in the bowl of a stand mixer fitted with a dough hook. Add milk mixture. With mixer running, add room-temperature butter, a bit at a time, blending well between additions. Mix on medium speed for 1 minute. Knead on medium-high speed until dough is soft and silky, about 5 minutes. Brush a medium bowl with some melted butter; place dough in bowl. Brush top of dough with remaining melted butter; cover with plastic wrap. Let dough rise in a warm, draft-free area until doubled in size, 1–1 1/2 hours. Chill dough for 2 hours. Make the topping: Preheat oven to 350°. Spread out nuts on a rimmed baking sheet. Toast until fragrant and slightly darkened, 10–12 minutes. Let cool completely. Melt butter in a small heavy saucepan over medium heat. Stir in brown sugar, cream, honey, and salt. Bring to a boil, reduce heat to medium, and simmer until glaze is golden brown and glossy, 3–4 minutes. Set aside. 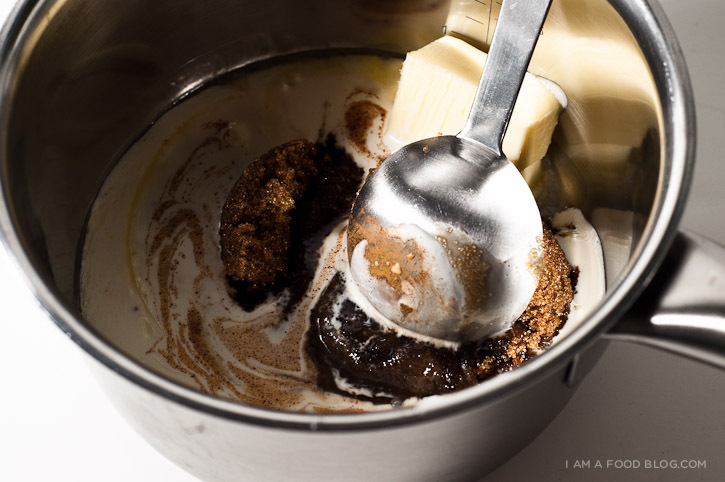 Make the buns: Cream together the butter, brown sugar and cinnamon. Set aside. Punch down dough; transfer to a floured work surface. Lightly dust top with flour. Roll out dough to a rectangle, about 8 inches x 6 inches. 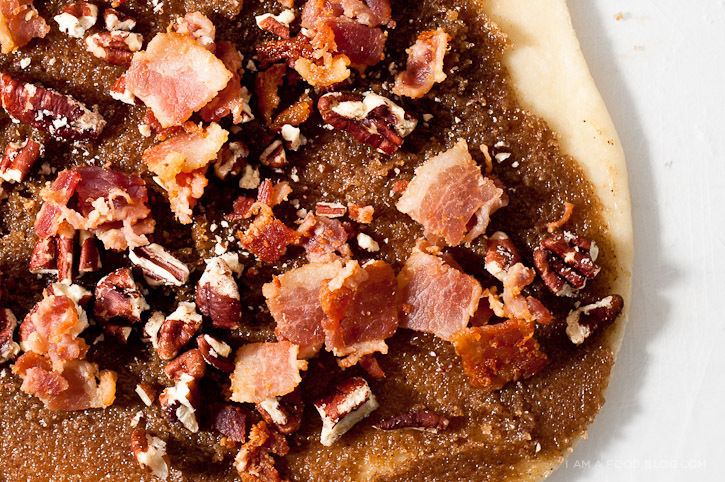 Evenly spread the cinnamon sugar mixture on top and sprinkle with 1/3 cup pecans and 1/4 cup bacon. Reserve remaining pecans and bacon for tops. Roll tightly and slice into 8 equal sized buns. Loosely cover pan with plastic wrap. Let buns rise in a warm, draft-free area until doubled in size, 45 minutes to 1 hour. Arrange a rack in middle of oven; preheat to 350°. Whisk egg with 1/2 tsp. water in a small bowl. Brush tops of buns with egg wash and top with remaining pecans and bacon. Bake, rotating pan halfway through until buns are golden brown, filling is bubbling, and an instant-read thermometer inserted into center of buns registers 185°, about 30 minutes. Let cool for 5 minutes. Spoon remaining glaze over. Sprinkle remaining pecans over. Let cool in pan on a wire rack. Enjoy buns warm or at room temperature. oh my. 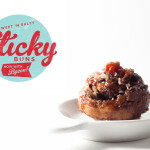 i love sticky buns, but my boyfriend doesn`t like the cinnamon. 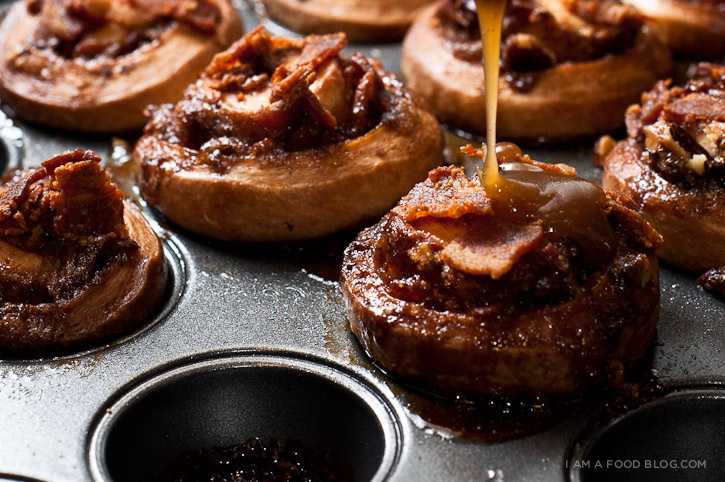 HOWEVER, he does LOVE bacon….maybe this way i`ll get him to eat sticky buns! LOL. Yummy – I love the idea of bacon with sugar! oh my goodness your blog is AWESOME. and this recipe is amazing! I am making this for Easter breakfast! Really festive flavors indeed! 1/2 an egg is about 1 1/2 tablespoons. Gently whisk your egg then measure out 1 1/2 tablespoons.